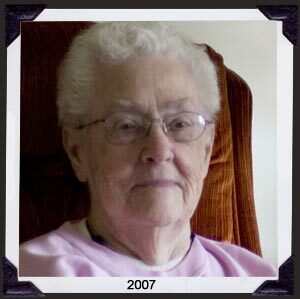 Click the button below to hear a short audio clip of Margaret Thume that was recorded in 2006. But I'll tell you, life's a funny thing when you get older and look back on what you've done and what you've been through, you wonder why you're here [laughs]... after all that stuff. Born in Trappe, MD, she was daughter of George Washington and Georgianna Hynson Greenwood. She had 11 other brothers and sisters: Helen, William Bishop, Lee, Fred, Woodrow, Elizabeth, Warner, Milton, William, Stella, and Bishop. But I'll tell you before we get to that one, when we were home, we'd get this stocking with an orange and an apple in it and a little bit of hard candy. That was what we got for Christmas. She got married on her 18th birthday in 1927 to Charles Thume. They farmed for awhile but it was hard work and they lost everything due to a combination of the Depression and Charles getting a bad back from carrying sacks of grain at Trappe Landing. While raising their children, Sue and Melvin, Margaret took odd jobs and Charles started doing carpentry work. I used to do a lot of sewing for people and I've still got the book where I wrote down who I did things for and how much it cost. It's amazing to see what little you got out of it but it meant a lot then. Then...Let's see. I didn't work when the kids were little unless it was just some odd jobs. Now Frank Baker and his wife raised turkeys there in Trappe and she'd want me to help her when they got ready to kill them, dress them and everything, and so I'd work at that. Just anything that come up that I could work at with the kids until they were big enough to look out for theirself. It's been a challenge to organize this properly. There are still more stories about Margaret's childhood and life in another section of this website I call "Memories". Here, you'll find stories about her parents, her brothers and sisters, her husband, her cooking, playing cards, and other things. Here they're arranged in the order that she told them to me. I may redo this but for the moment, please bear with me.